Dysproteinemia is characterized by the overproduction of an Ig by clonal expansion of cells from the B cell lineage. The resultant monoclonal protein can be composed of the entire Ig or its components. Monoclonal proteins are increasingly recognized as a contributor to kidney disease. They can cause injury in all areas of the kidney, including the glomerular, tubular, and vascular compartments. In the glomerulus, the major mechanism of injury is deposition. Examples of this include Ig amyloidosis, monoclonal Ig deposition disease, immunotactoid glomerulopathy, and cryoglobulinemic GN specifically from types 1 and 2 cryoglobulins. Mechanisms that do not involve Ig deposition include the activation of the complement system, which causes complement deposition in C3 glomerulopathy, and cytokines/growth factors as seen in thrombotic microangiopathy and precipitation, which is involved with cryoglobulinemia. It is important to recognize that nephrotoxic monoclonal proteins can be produced by clones from any of the B cell lineages and that a malignant state is not required for the development of kidney disease. The nephrotoxic clones that do not meet requirement for a malignant condition are now called monoclonal gammopathy of renal significance. Whether it is a malignancy or monoclonal gammopathy of renal significance, preservation of renal function requires substantial reduction of the monoclonal protein. With better understanding of the pathogenesis, clone-directed strategies, such as rituximab against CD20 expressing B cell and bortezomib against plasma cell clones, have been used in the treatment of these diseases. These clone-directed therapies been found to be more effective than immunosuppressive regimens used in nonmonoclonal protein–related kidney diseases. Dysproteinemia results from the overproduction of a monoclonal Ig (1). All B cell clones can produce monoclonal gammopathy, but the incidence varies. They include CD20+CD38− B cell clones involved in non-Hodgkin lymphoma, CD5+CD19+ clones in chronic lymphocytic leukemia, CD19+CD38+ clones in lymphoplasmacytic lymphoma that produce Waldenström macroglobulinemia, and CD19−CD38+ plasma cell clones in multiple myeloma (2). Monoclonal gammopathy is nearly universal with the latter two clones but less common in chronic lymphocytic leukemia and CD20+CD38− B cell clones. Only one Ig light chain can be produced by a clone. In rare circumstances, the Ig heavy chain is truncated and circulates as a monoclonal heavy chain. Because the size of the monoclonal protein often reflects the clonal burden, it can be used as a biomarker for diagnostic and prognostic purposes. Monoclonal gammopathy of undetermined significance (MGUS) is distinguished from multiple myeloma and Waldenström macroglobulinemia by the size of the monoclonal protein (M protein) or serum free light chain (sFLC) (2,3). Conversely, response to therapy is determined by the reduction of M protein and/or sFLC concentration (4). The concentration of sFLC at diagnosis is also prognostic in Ig light chain (AL) amyloidosis (5). Some M proteins however are toxic and cause organ dysfunction. Such is the case in AL amyloidosis. The misfolded monoclonal free light chain (FLC) forms amyloid that is deposited in the soft tissues (6). The organ is damaged by the monoclonal FLC rather than the clonal mass (7). This explains why most patients have <10% bone marrow plasma cells. In those with >10% bone marrow plasma cells, most do not have any myeloma-defining events known as hypercalcemia, AKI as a result of light-chain cast nephropathy, anemia, or lytic bone lesions (CRAB). In fact, over 80% of the patients would be best classified as having monoclonal gammopathy of renal significance (MGRS). Animal studies have shown that only the M protein is necessary for reproduction of the renal lesion (8). Unfortunately, efforts to identify properties that predict nephrotoxicity have been unsuccessful so far. The toxicity is not limited to the kidney, because these proteins can also cause neuropathies, dermopathies, ocular disorders, and other multisystemic diseases (9). The kidney is the organ most affected by M proteins. A number of factors may contribute to this (10). The kidneys are exposed to more cardiac output than any other organ, except the lungs. This increased exposure is paired with the unique environment, where the pH and electrolyte concentrations are present in no other tissues. These changes can alter the chemical characteristics of the M protein, making it more toxic (11). Finally, receptors and proteins are present in the kidney that can interact with Igs. The megalin-cubilin receptor actively endocytoses FLC for degradation in proximal tubular cells (12). The inability to degrade certain Ig light chains is the pathogenic basis in light-chain proximal tubulopathy. On the other hand, formation of obstructive casts by the binding and precipitation of monoclonal FLCs and Tamm Horsfall protein is the characteristic of light chain cast nephropathy. (13). Several mechanisms of nephrotoxicity have been described, which include deposition, complement activation, cytokine activation, and precipitation (Figure 1) (14,15). Deposition is the most common and seen in Ig-related (AIg) amyloidosis, monoclonal Ig deposition disease, proliferative GN with monoclonal Ig deposits, immunotactoid GN, and fibrillary GN (FGN) (16). The deposits can be organized (as in AL, immunotactoid GN, and FGN) or unorganized (e.g. proliferative GN with monoclonal Ig deposits and monoclonal Ig deposition disease). Extrarenal deposition can occur especially in AIg amyloidosis and monoclonal Ig deposition disease (17–21). Extrarenal involvement is rare with immunotactoid GN and FGN and has not been described in proliferative GN with monoclonal Ig deposits (22–25). Mechanisms of glomerular toxicity by monoclonal gammopathy. AIg amyloidosis, immunoglobulin-derived amyloidosis. ; C3G, C3 glomerulopathy; MIDD, monoclonal Ig deposition disease; PGNMID, proliferative GN with monoclonal Ig deposits; POEMS, polyneuropathy, organomegaly, endocrinopathy, monoclonal gammopathy, and skin changes. Precipitation is the mechanism of injury in cast nephropathy, cryoglobulinemia, and (cryo)crystalglobulinemia. This occurs predominately in the distal tubules in cast nephropathy (10). In contrast, the precipitation occurs intravascularly in cryoglobulinemic GN (26). Cryoglobulins are most characteristically found in the glomerular capillaries, often resulting in pseudothrombi formation described as cryoplugs. Complement activation and cytokine activation are also associated with M proteins. The incidence of monoclonal gammopathy in patients with C3 glomerulopathy has been found to far exceed that of the normal population, especially in people >50 years of age (27–30). Although C3 nephritic factor and autoantibody against factor H have been reported in some patients and while others have complement gene polymorphisms, the mechanism of complement activation remains undetermined in the majority of patients (27,29–31). Complement is also activated in monoclonal gammopathy–associated membranous nephropathy, proliferative GN with monoclonal Ig deposits, immunotactoid GN, FGN, and cryoglobulinemic GN. Cytokine activation is involved in the renal lesion of patients with polyneuropathy, endocrinopathy, organomegaly, monoclonal gammopathy, and skin changes (POEMS) syndrome (32). The cytokines activation results in a glomerulopathy that resembles thrombotic microangiopathy but without the microangiopathic hemolytic anemia. Interestingly, the M protein is not identifiable in the kidney in either of these entities, and a direct link to either mechanism has not been identified. AIg amyloidosis is the most common glomerular lesion associated with monoclonal gammopathy (33). AL amyloidosis is the most common subtype, but AH amyloidosis and Ig heavy and light chain (AHL) amyloidosis also exist (Table 1). Clinically, the entire group behaves similarly, with a median age of presentation in the low 60 years of age and a slight dominance of men (approximately 60%). Patients present with mild renal impairment (median serum creatinine [Scr] of 1.2 mg/dl) and nephrotic-range proteinuria (6 g/d). Nephrotic syndrome is present in more than two thirds of patients. ESRD predominantly occurs in patients who present with renal manifestation (34). Recurrence after kidney transplant has been reported but can take years to occur (35). AIg amyloid is systemic and can be deposited in any visceral organ (17). The heart is the most common extrarenal organ involved followed by nerves. Heart involvement may be less common in AH and AHL amyloidosis versus AL amyloidosis (36). Patients with severe heart involvement have the poorest prognosis, even with modern therapies (37). Although 40% of patients have >10% clonal plasma cells on bone marrow biopsy, <20% actually have symptomatic multiple myeloma. The lethality of this disease stems from the progressive organ dysfunction, which is not dependent on clonal expansion as in multiple myeloma. Amyloid deposits can be found in all three compartments of the kidney (33). Amyloid deposits are best seen along the glomerular basement membranes (GBMs) and mesangium, causing mesangial expansion (Figure 2A). The mesangial deposits can appear nodular. Deposits are typically periodic acid–Schiff (PAS) and silver negative (Figure 2A). However, amyloid spicules, which are a parallel alignment of subepithelial fibrils perpendicular to the GBM, appear silver positive. Amyloid fibrils are congophilic and display an apple green birefringence under a polarized light (Figure 2, B and C). Immunofluorescence studies show a light-chain restriction with AL and AHL (Figure 2F). Monoclonal Ig heavy chain is seen in both AHL and AH, but monoclonal Ig light chain is absent in AH. Amyloid deposits are typically identified in the vessels (>80%) and the interstitium (53%–63% of patients). On electron microscopy (EM), amyloid appears as solid randomly arranged fibrils with a diameter of 7–12 nm irrespective of the precursor protein (Figure 2, D and E). Typing of some amyloid can be done by immunohistochemistry/immunofluorescence (38). However, mass spectrometry with proteomic analysis has become the gold standard for amyloid typing (39). Most recently, urinary exosomes have been investigated as a potential tool in diagnosis and response assessment in AIg amyloidosis (40). Renal biopsy in a 72-year-old woman showing lambda light chain amyloidosis. (A) Glomerular mesangial areas and glomerular capillary walls are markedly and globally expanded by cellular silver-negative amyloid deposits (×200). (B) Amyloid deposits by definition are Congo red positive (×200). (C) Under polarized light, they show anomalous colors (yellow, green, and red; ×200). (D) The deposits exhibit randomly oriented, straight fibrils on transmission electron microscopy (49,000). (E) Amyloid spicules, resulting from parallel alignment of amyloid fibrils perpendicular to the glomerular basement membrane, are seen (electron microscopy, ×13,000). Amyloid spicules are more common in Ig light chain amyloidosis than serum amyloid A amyloidosis and are not usually seen in other types of renal amyloidosis. (F) On immunofluorescence, glomerular amyloid deposits stain brightly for λ-light chain (×200). Staining for κ-light chain was negative (not shown). Monoclonal Ig deposition disease is also represented by three subtypes (19). Light-chain deposition disease is the most common followed by light- and heavy-chain deposition disease, whereas heavy-chain deposition disease (HCDD) is the rarest. The subtypes are indistinguishable by light microscopy. They can only be separated by immunofluorescence. The Ig heavy chain in HCDD is typically truncated (41). Patients with HCDD have heavier proteinuria, but otherwise, all patients with monoclonal Ig deposition disease behave similarly (19). The median age of these patients is between 56 and 64 years old. Nearly two thirds are men (19,21,42). Median Scr ranges from 2.2 to 3.8 mg/dl. Proteinuria averages between 1.5 and 4.1 g/d. Extrarenal manifestations mainly involve the heart and liver but are much less common than in AL amyloidosis. Most patients with monoclonal Ig deposition disease have MGRS instead of multiple myeloma. A series from Italy found multiple myeloma in 65% of patients and chronic lymphocytic leukemia in 3% of patients (20). However, when myeloma was defined by CRAB, the rate dropped to 20%–22%, suggesting that most of the patients had smoldering multiple myeloma rather than multiple myeloma (19,43). Mortality of these patients is largely dependent on the presence of multiple myeloma. Recurrence in the renal allograft is quite common and rapid (44). The most common renal histologic finding is nodular mesangial sclerosis (19,42) (Figure 3A). The nodules are PAS and silver positive and can mimic those of diabetic nephropathy (Figure 3A). Membranoproliferative features, such as GBM duplication and mesangial hypercellularity, may be present. Cellular crescents can be seen focally in patients with rare cases (particularly in αHCDD) (45). Linear staining of the GBM and even more consistently, the tubular basement membranes (TBMs) by a single Ig light chain is characteristic of light-chain deposition disease and light- and heavy-chain deposition disease on immunofluorescence (Figure 3, C and D). Nearly 90% of patients have a κ-isotype. These deposits are electron dense and have an amorphous or powdery appearance on EM (Figure 3B). 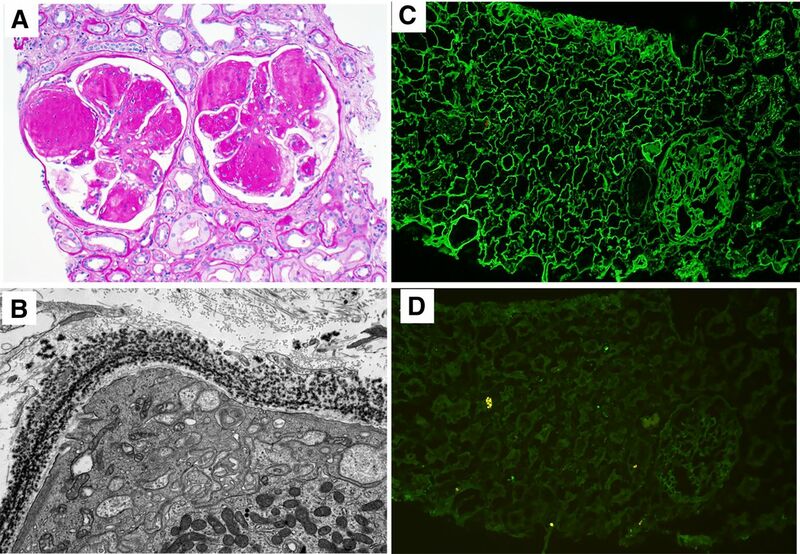 Light-chain deposition disease on renal biopsy exhibits nodular mesangial sclerosis and punctate linear monoclonal deposits along renal basement membranes. 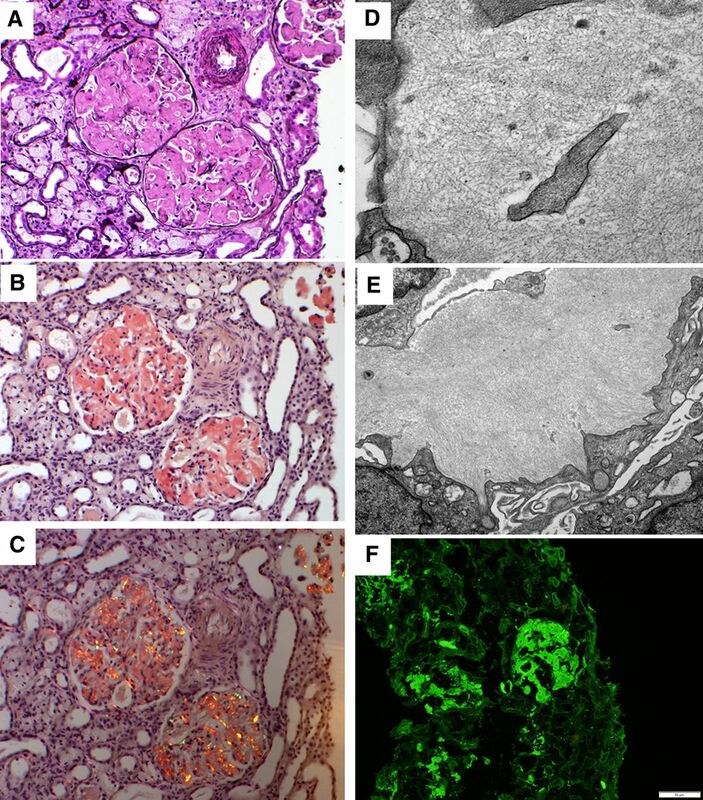 (A) Glomeruli exhibit marked nodular mesangial expansion by periodic acid–Schiff-positive material, mimicking diabetic glomerulosclerosis (×200). (B) On electron microscopy, punctate powdery electron dense deposits are seen along tubular basement membranes (×15,000). Similar deposits are frequently seen along glomerular basement membranes and in the mesangium (not shown). On immunofluorescence in this case of λ–light-chain deposition disease, there is diffuse linear glomerular and tubular basement membrane staining for (C) λ (×100) with (D) negative κ (×100). Proliferative GN with monoclonal Ig deposits is another renal disease with nonorganized monoclonal Ig deposits. The deposits are composed of the entire Ig and usually an IgG, although IgA and IgM have rarely been described (46). Patients present with renal impairment (median Scr of 2.8 mg/dl), proteinuria (median of 5.7 g/d), and hematuria (22). Multiple myeloma is rare, with approximately 80% of patients having no circulating M protein detectable at the time of diagnosis. Clonal identification is difficult if an M protein is not detected (46). The renal lesion is characterized by proliferative GN (47). Predominantly membranoproliferative GN and endocapillary proliferative GN are the two most common patterns of injury (Figure 4A). 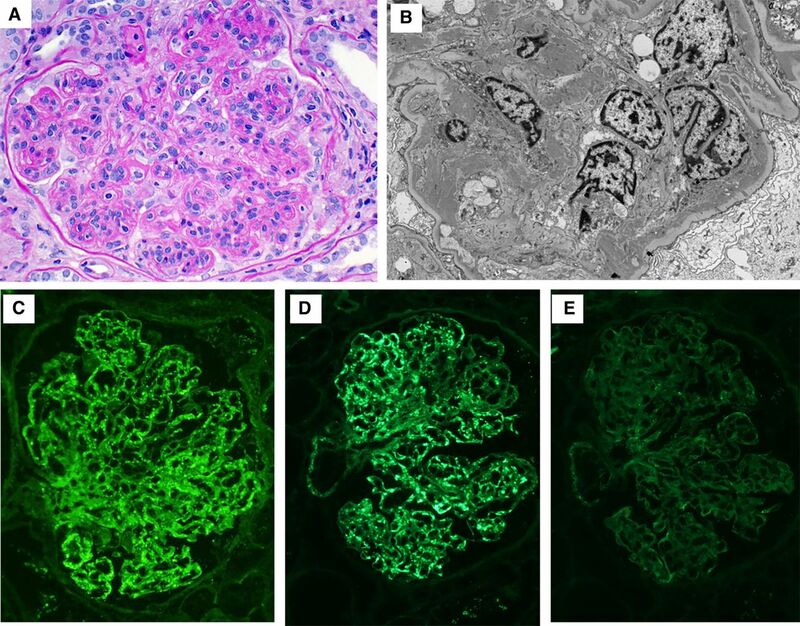 Segmental membranous nephropathy features can coexist, and a pure mesangial proliferative GN pattern has been reported. Crescents are seen in one third of patients, and crescentic transformation has been reported after upper respiratory tract infection and treatment with filgrastim (48). The deposits on EM are seen predominately in the mesangium and subendothelial space, although subepithelial deposits can also be detected in some patients. The texture of deposits is typically finely granular without substructure (Figure 4B), although focal ill-defined fibrils or lattice-like arrays can be seen. On immunofluorescence, the deposits are confined to glomeruli and exhibit IgG3 subclass in 66%) and κ light chain in 73% and λ in 27% (Figure 4, C–E) (22,47). Most cases show bright glomerular C3 and C1q staining in the same distribution as IgG staining. Proliferative GN with monoclonal Ig deposits histologically exhibits a membranopliferative GN with monoclonal IgG3 granular deposits. (A) The glomerulus depicted shows a membranoproliferative pattern of injury with lobular accentuation of the tuft due to prominent mesangial hypercellularity and mild mesangial sclerosis. There is widespread duplication of the glomerular basement membrane with associated cellular interposition. The glomerular capillary lumina are occluded by endothelial cell proliferation and infiltrating mononuclear inflammatory cells (periodic acid–Schiff; ×400). (B) Large mesangial and subendothelial granular electron dense deposits (without substructure) are seen by transmission electron microscopy (×6000). In this case of proliferative GN with monoclonal Ig deposits, there is bright granular mesangial and glomerular capillary wall staining for (C) IgG and (D) λ-light chain with (E) negative staining for κ-light chain on immunofluorescence (×400 for C–E). Cryoglobulinemic GN is a consequence of one of the three types of cryoglobulins. Only types 1 and 2 contain monoclonal Igs (49). Type 1 is all monoclonal, usually composed of an IgM but can be IgG or IgA. Type 2 is mixed and contains a monoclonal IgM acting as a rheumatoid factor against polyclonal IgG. Type 3 is also mixed, made up of polyclonal Igs, usually the result of infection or autoimmune diseases. All type 1 and some type 2 are the results of a plasma cell dyscrasia or lymphoproliferative disorder, particularly lymphoplasmocytic lymphoma. However, hepatitis C is the most common cause of type 2 cryoglobulinemia in the world. GN is most common with type 2 but can occur in all three types. Median age is 62 years old, and it is more common in women (50). Extrarenal manifestations are common and often present as purpura, ulcers, peripheral neuropathy, arthralgias, and vasculitis of other organs (49). Severe hypertension is also commonly observed. Cryoglobulinemic GN presents mainly in a membranoproliferative pattern (Figure 5A) (51). Eosinophilic cryoglobulins are commonly observed in the glomerular capillary lumina. These are strongly PAS positive and trichrome red (Figure 5A). Leukocytoclastic vasculitis is common with neutrophils in the acute phase, whereas macrophages and monocytes are in the acute and chronic phases. Crescents are present in some cases. The Ig deposits are dependent on the makeup of the cryoglobulin; however, C3 is often prominent. In type 2, both IgM and IgG will be present, but light-chain restriction may not be shown, because the IgG is polyclonal. Light-chain restriction is usually present in type 1. In some cases, the deposits do not stain on routine immunofluorescence on frozen tissue and require paraffin immunofluorescence with protease digestion for detection (52). Intraluminal, mesangial, and subendothelial deposits are seen on EM along with double contouring of the GBM. The deposits in most cases are focally organized, showing curved or straight microtubules (Figure 5B). Cryoglobulinemic GN shows membranoproliferative GN with microtubular deposits. (A) Most cases of cryglobulinemic GN exhibit a membranoproliferative GN pattern of injury characterized by mesangial hypercellularity and expansion and duplication of the glomerular basement membranes (×200). The hallmark histologic finding in cryoglobulinemic GN is glomerular intracapillary immune deposits (so called “pseudothrombi”), which appear red on trichrome stain. In most but not all cases of cryoglobulinemic GN, the deposits on electron microscopy focally exhibit organized substructure. The most common substructures observed are short, straight to mildly curved microtubules as shown in B (×49,000). Immunotactoid GN is another glomerular disorder resulting from deposition of microtubules (53). By definition, cryoglobulinemic GN must be ruled out, because they are difficult to differentiate histopathologically. Other than the absence of cryoglobulins, extrarenal manifestations are uncommon in immunotactoid GN. Rarely, vasculitic skin lesions, immunotactoid corneal and liver deposits, and mononeuritis multiplex have been reported (54–56). Median age ranges from 57 to 61 years old, with a slight increased prevalence in men (53,54). Most patients present with nephrotic-range proteinuria, with a range of 6–11 g/d. Median creatinine at presentation is 1.5 mg/dl. Microscopic hematuria can be seen in some patients on urinalysis. A monoclonal gammopathy is identified in 80%–90% of cases. Hypocomplementemia is not uncommon. One particular characteristic of immunotactoid GN is its association with chronic lymphocytic leukemia. Approximately 50% of the patients had chronic lymphocytic leukemia or monoclonal B cell lymphocytosis (MBL; a chronic lymphocytic leukemia clonal disorder) (54,57). The most common pattern in immunotactoid GN is membranoproliferative with mesangial expansion, hypercellularity, and double contouring (53). 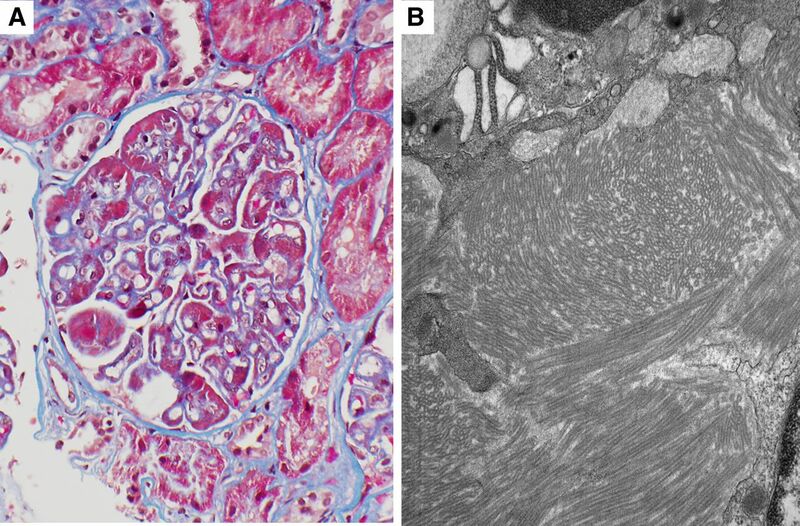 Large subendothelial deposits mimicking wire loop–type deposits of lupus nephritis can be seen in some cases (Figure 6A). Immunotactoid GN could also present with membranous, like features, with thickening basement membranes and spikes either globally or segmentally. The least common pattern is endocapillary proliferative GN characterized by leukocyte infiltration, resulting in luminal occlusion but without GBM duplication. Focal crescents and fibrinoid necrosis are seen in a small number of patients (53,58). Patients who have underlying chronic lymphocytic leukemia or lymphoplasmocytic lymphoma often have neoplastic lymphocytic infiltration in the kidney. On immunofluorescence, nearly 90% have IgG staining of 2–3+ intensity. The rest stain for IgA and IgM. C3 staining follows the same pattern as the IgG. C1q deposits are seen in over one half of cases. Light-chain restriction can be shown in 69%–93% of cases. IgG1 represents about one half of the IgG subtypes in immunotactoid GN. The deposits are uniformly composed of microtubules with hollow centers that have an average diameter of 31 nm but can range from 9 to 52 nm (53,54). They are typically arranged in parallel arrays (Figure 6B). Deposits can be found in the mesangium and the subendothelial and subepithelial spaces. Photographs of kidney biopsy specimen from a patient with immunotactoid glomerulopathy show large subendothelial deposits composed on microtubules. (A) In this case of immunotactoid glomerulopathy, large trichrome red subendothelial deposits (mimicking wire loop–type deposits of lupus nephritis) are seen (×400). Segmental duplication of the glomerular basement membranes is seen. (B) On electron microscopy, the deposits in immunotactoid glomerulopathy are composed of microtubules that show parallel alignment (×24,500). FGN is the first of two entities that are only occasionally associated with a monoclonal gammopathy. The lesion is characterized by glomerular deposition of nonamyloid fibrils. Although it shares many features with immunotactoid GN histologically, the etiology is quite different; <20% of patients have a monoclonal gammopathy in FGN (59). Other conditions associated with FGN include solid malignancies, autoimmune diseases, and hepatitis C. Hypocomplementemia is rare. The average age of patients ranges from 50 to 59 years old (54,59,60). Proteinuria is less severe than immunotactoid GN, averaging between 5 and 5.6 g/d. Scr at presentation ranges from 1.6 to 3.2 mg/dl. Microscopic hematuria and hypertension are observed in over one half of the patients. Mesangial proliferative GN is the most common pattern in FGN seen in approximately 70% of patients (54,59,60). This is followed by membranoproliferative GN, endocapillary proliferative GN, and segmental membranous nephropathy pattern and diffuse sclerosing GN. Crescents can be seen in up to one quarter of cases. IgG is present in 100% of patients, whereas IgA and IgM can be seen on immunofluorescence in some patients. C3 follows the IgG staining pattern, and C1q is seen in some patients. The majority of cases have polyclonal light-chain staining, with only approximately 10% of cases showing light-chain restriction. In addition to glomerular deposits, TBM staining can also be found in some cases. Fibrils are solid and randomly arranged, with a diameter ranging from 9 to 26 nm. Fibrils are most commonly found in the mesangium but can be in the lamina densa and subepithelial space as well as the TBM. C3 glomerulopathy is represented by C3 GN and dense deposits disease. This topic is discussed in greater detail elsewhere in this issue. Direct evidence implicating the monoclonal gammopathy as a cause is lacking in most patients (27,28,30). Rather, the association is on the basis of epidemiologic data. This is especially pertinent in patients over 50 years of age, in whom the prevalence of monoclonal gammopathy ranges from 31% to 83% versus approximately 3% in the age-matched population (28,30,61). Monoclonal gammopathy is a sequela of lymphoproliferative disorders or plasma cell dyscrasia. These disorders are classified as an MGUS or MBL if they do not meet criteria for symptomatic lymphoma or multiple myeloma. However, if the clone produces a nephrotoxic M protein, it would be renamed as MGRS. Each hematologic disorder has its own preferential kidney diseases, although no renal lesion is exclusive to any hematologic disorder. Multiple myeloma is a malignant condition of the plasma cells. Symptomatic multiple myeloma is diagnosed either by the presence of a CRAB lesion or when the patient is at high risk of end organ damage (3). The most common kidney disease in multiple myeloma is cast nephropathy, which has now become a myeloma-defining event (3). However, cast nephropathy can also be seen in patients with Waldenström macroglobulinemia and chronic lymphocytic leukemia (62,63). The most common glomerular lesion is AL amyloidosis, which is present in 3%–5% of patients with multiple myeloma during autopsy (64). Monoclonal Ig deposition disease was identified in only 2% in this study. Rate of monoclonal Ig deposition disease was found to be similar to AL amyloidosis (22% versus 21%, respectively) in a renal biopsy series of patients with multiple myeloma (65). The rates were also similar in patients with MGRS/MGUS (11.6% versus 10.7%, respectively) (66). Interestingly, cryoglobulinemic GN was seen in 16.5% of patients with MGRS/MGUS but has not been reported in patients with multiple myeloma. FGN, immunotactoid GN, and light-chain proximal tubulopathy are rarely reported with multiple myeloma. Lymphoplasmocytic lymphoma is a lymphoproliferative disorder that possesses both B cell (CD19) and plasma cell (CD38) characteristics. Waldenström macroglobulinemia is the condition characterized by a serum monoclonal IgM produced by the lymphoplasmocytic lymphoma. More than one set of diagnostic criteria exist for Waldenström macroglobulinemia. One requires >10% involvement of lymphoplasmocytic lymphoma in the bone marrow. Patients with less lymphoplasmocytic lymphoma involvement are considered to have IgM MGUS, and those with >10% but no end organ damage are classified as smoldering Waldenström macroglobulinemia (67). In the past, dense eosinophilic occlusive capillary thrombi were commonly found (68). All patients with these endocapillary thrombi had either cryoglobulins or high concentrations of monoclonal IgM. EM was not performed in this study. 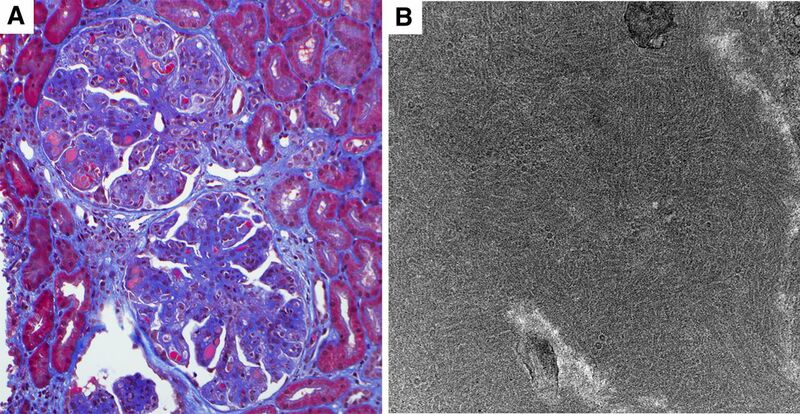 Two more recent series, however, found that AIg amyloidosis was the most common renal lesion in Waldenström macroglobulinemia. Cryoglobulinemic GN had dropped to second (43,63). Reasons for this are unclear, but kidney biopsy may have been skipped if cryoglobulins were detected in the blood. Cast nephropathy and monoclonal Ig deposition disease were the next most common in one series, whereas cast nephropathy and MPGN were the next most common in another series. Intracapillary IgM deposits were much less commonly found. Other lesions seen were thrombotic microangiopathy and light-chain proximal tubulopathy with Fanconi syndrome. Lymphoplasmocytic lymphoma infiltration was common. Chronic lymphocytic leukemia is the blood component of the same disease represented by small lymphocytic lymphoma in the lymphoid tissue. MBL is the MGUS equivalent in chronic lymphocytic leukemia. Kidney disease is less common in chronic lymphocytic leukemia than in Waldenström macroglobulinemia or multiple myeloma. A large study of 1043 patients newly diagnosed with chronic lymphocytic leukemia/small lymphocytic lymphoma found that 10% of patients had renal impairment, whereas another 14.5% developed renal impairment during the course of their disease (69). Another study from the same institution found that only 1.2% of all patients with chronic lymphocytic leukemia or MBL (n=4024) underwent a kidney biopsy (62). Despite the lower prevalence, the variety of kidney diseases was similar to that of multiple myeloma and Waldenström macroglobulinemia. chronic lymphocytic leukemia infiltration was the most common histopathologic finding, accounting for 73% of patients (70). The chronic lymphocytic leukemia infiltration often coexisted with other lesions, and granulomatous reaction was noted in some (62,71). Cryoglobulinemia GN (20%) was the most common glomerular lesion followed by minimal change disease (13.3%). Immunotactoid GN, FGN, AHL amyloidosis, and MPGN each accounted for 6.6%. In another study, MPGN was the most common glomerular lesion (20%) followed by minimal change disease (10%). Amyloidosis, membranous nephropathy, and mesangial proliferative GN were also reported along with TMA (12%) and light-chain cast nephropathy (7%). Monoclonal gammopathy of renal significance is a term used to describe hematologic conditions that produce a nephrotoxic M protein but do not meet criteria for symptomatic multiple myeloma or lymphoma (72). It differs from MGUS, which cannot have any end organ damage, by the presence of the kidney disease. Like MGUS, however, monoclonal gammopathy of renal significance could arise from any clone from the B cell lineage. However, by definition, cast nephropathy could not be the result of monoclonal gammopathy of renal significance, because it is a myeloma-defining event (3). It is now recognized that most glomerular lesions associated with an M protein are due to MGRS rather than its malignant counterpart (16). In AL amyloidosis and monoclonal Ig deposition disease, evidence suggests that patients with coexistence of multiple myeloma have a worse prognosis compared with those with MGRS (73,74). This suggests that patients with kidney diseases associated with MGRS may require different management from those secondary to multiple myeloma/Waldenström macroglobulinemia/chronic lymphocytic leukemia. The management of glomerular disease secondary to monoclonal gammopathy has changed significantly since the introduction of the concept of MGRS (72,75). Treatment is no longer decided by the renal histology but rather, is decided by the nature of the clone producing the M protein. Initiation of therapy also no longer relies on presence of malignant characteristics. Traditional immunosuppressive drugs and renin-angiotensin system blockade are generally ineffective at preventing ESRD (76). Clone-directed therapy is the key. Thus, clonal identification is extremely important in choosing the right treatment. The renal histology, however, remains useful for predicting the natural history, clinical features, and recurrence after kidney transplantation. One should not forget about extrarenal involvement in patients with AL amyloidosis and monoclonal Ig deposition disease (17,21,42). Patients with severe heart involvement may need to have modified chemotherapy, aggressive fluid management, and care for CKD (77–79). The speed of recurrence after kidney transplant should be taken into account when deciding on transplantation (35,44,80). A good understanding of the differences can help select the best options for these patients. The most important drug in the treatment of glomerular diseases associated with monoclonal gammopathy is bortezomib, a proteosome inhibitor. Other proteosome inhibitors are now available, but bortezomib has the most robust data in the treatment of these diseases (81). Bortezomib represents the most important advance in the treatment of AIg amyloidosis since the introduction of high-dose melphalan followed by autologous stem cell transplant, melphalan, and dexamethasone (82,83). In combination with cyclophosphamide and dexamethasone, bortezomib produced response rates as high as 94%, with 66%–71% having a very good partial response (VGPR) (84,85). Achievement of VGPR, which is measured by either a difference of the involved minus the uninvolved sFLC of <40 mg/L or >90% reduction of difference of the involved minus the uninvolved sFLC, has been found to be associated with significant improvement in overall and renal survival (86,87). Patients with complete response are less likely to have recurrence after kidney transplant (88). Bortezomib seems to be the most effective agent in monoclonal Ig deposition disease (21,42,74,89). In one study, immunomodulatory drugs represented by thalidomide and lenalidomide were found to be less effective in achieving VGPR or better responses (21). Fortunately, the hematologic response can be improved by the addition of autologous stem cell transplant. Achievement of VGPR in monoclonal Ig deposition disease similarly has been found to improve renal and patient survival (21,42,74,89). Kidney transplant has been successfully performed in patients with hematologic complete response without recurrence. A complete response is defined by negative serum and urine immunofixation and normal sFLC ratio. In multiple myeloma, it is confirmed by a negative bone marrow biopsy. More recently, achievement of VGPR or better was found to be effective at preventing the development of ESRD in patients with C3 glomerulopathy with monoclonal gammopathy (76). In this study, 76% of the patients used a bortezomib-based regimen, whereas 7% used a rituximab-based chemotherapy. Rituximab should be the first choice in clones expressing strong CD20. The current evidence strongly supports the strategy of clone-directed therapy, and the goal of therapy should be a hematologic response of VGPR or better. Monoclonal gammopathy is a well recognized cause of kidney disease. The monoclonal gammopathy is produced by a number of clones from the B cell lineage. Symptomatic multiple myeloma or lymphoma is no longer required for the development of kidney disease. However, because of the clonal nature of these diseases, clone-directed therapy is required for disease control. Multiple studies have found that a VGPR is needed for preservation of kidney function and improvement in patient survival. Achievement of a complete hematologic response has been found to reduce the risk of recurrence after kidney transplantation. Given the complexity of these diseases, a multidisciplinary approach is preferred for the best outcome of these patients.